The city of Bremerton would like to know who the woman is pictured at the end of this entry. 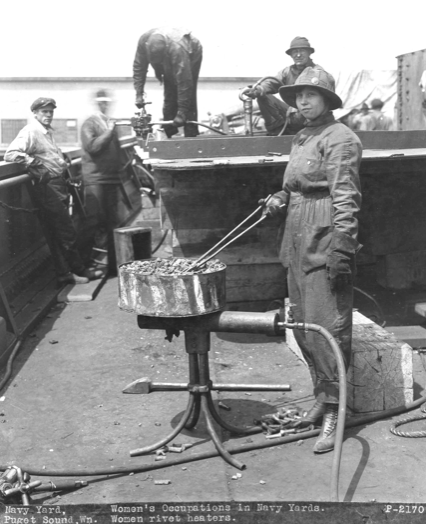 Gary Sexton, the city’s economic development director, picked her photo as one representing what went on at the shipyard during the first world war. A statue of the woman will be placed at the newest downtown park, expected to open in a few months. If you know who she is, contact the city at (360) 473-5269 or by e-mail at alyce.fierro@ci.bremerton.wa.us. Have you already contacted the historical society? There might be related photos. I’ll share this with some of the Manette History Club members and see what they have. I sure don’t know who she is, but I love the little smirk to her lips. I really hope the smirk makes it to the statue. Maybe it would be better if we didn’t get a positive ID. Rather have her be representative of all the women who stepped up and paved the way for us. My great Aunt Marie was a machinist during WWII, and though she loved her job, and they loved her she had to relinquish it when the men came back from war. Sort of an early RIF system; men in women out. But they did show that women were able to do many of the jobs formally closed to them. As a former shipyard worker and forklift driver, I am grateful for what this woman and so many others did, not only out of patriotism, but for the desire to acheive in areas that were new. So Steven, on the actual article, folks are really against this statue due to the cost of the park ($5M). The perception is that the City is using local taxpayer money (i.e., part of our City budget after the City recently announced the shortfall) to pay for this. As you can tell by the comments (http://www.kitsapsun.com/news/2009/jan/19/bremerton-looking-for-identity-of-its-unknown/), not a single one in true support has been made. I know we had some types of grants to pay for the park…would you be able to point to any previous stories where the $5M came from in order for people to see exactly how Bremertonians are paying for this park addition and statue? Good post Carlos. Several of the governing agencies in this town need a re-education on the importance of public perception when it comes to spending taxpayer money i.e…Bremerton School Board and the City of Bremerton. Of course the flip side of perception is that “our” neighborhood could be perceived as a breeding ground for trouble makers like…you…me….Louis and others for bringing them to task. 5 million for statues and volcanic fountains, but they can’t seem to permanently fix the sinking pothole on the street near our homes which is getting bigger with each layer of “fix” asphalt they add on top of it and is inching closer to the manhole for the main water line that serves our neighborhood. Good times ahead. The dart board is waiting…..Steven you promised us some Port Orchard humor….I am holding you to that. Do you folks really believe that all the good press and promotion Bremerton has gotten from major publications over our ‘new’ look would have happened without the park and ‘new’ downtown? Will filling a pot hole draw tourists? What good would a top rated school do in a town without visionary leadership and good city government? Sometimes it is helpful to look beyond a pothole. Sharon, the park on top of the tunnel can be beautiful, functional and frugal. Visionary leadership is important. It is also important for us as citizens to remind the leadership of the priorities we have as a community for our tax dollars when we witness outright waste and excess. I say, put the basics of the park together now in a financially responsible way (trees, rocks, paved pathway). Leave the statues, volcanos and streams for private funding or for a future time when there is more money available for such things. In the neighborhood where Carlos and I live we have looked “beyond the pothole”. Carlos was instrumental in getting a very large group of us from the neighborhood organized this past summer where we donated our time, labor, tools and money and joined it with some funding from the city to improve a significant number shared of area’s on our street. We have been good stewards with the money given to us by the city now we expect the city to be good stewards with ours. Thanks for your kind comments to me on the education blog. I did appreciate them. (smile). You know I put my time and money where my mouth is…and that’s not just for education. And you did what most people in a good community neighborhood do – work together to make the neighborhood better. Good for the city to offer financial assistance. Smart of you all to join together on such a beneficial project. The Bremerton park would be another ho hum park without the things that you think should wait for another, better time. There is rarely another better time later. For those who wait to go back to a project, many find they missed the boat. That little park is magnificent, a little jewel by the dock. Private funding for art is sometimes a good idea.. Too bad the Silverdale park didn’t wait for it. Oh sure it all starts out innocently enough. A statue here, a volcanic fountain there, but Sharon you know it quickly gets out of hand. There is already a Jewel of a park by the ferry dock. My family spends a lot of time there during good weather. There is NO need to excessively fund another one right now. Give me a ho hum park and use my tax dollars for critical street repairs. Speaking of out of hand spending, have you seen this article from the Wall Street Journal regarding city requested money from the stimulus bill? http://online.wsj.com/article/SB123369271403544637.html The city of Chula Vista, CA is requesting $500,000 for a dog park. A dog park. It was bad enough certain Kitsap County residents had to pay for one in South Kitsap. Look at the outrage that came from that expenditure. Now it looks like all of us will be paying for one in Chula Vista, CA. This is what happens to unchecked spending by visionary leadership. Checks and balances need to be in place for a reason. Ouch. Dog parks, Collen, are the ultimate. Outrage, that is. But not from the citizens of PO/SK. Hey, what is $200,000.00 more than the $300,000.00 Jan Angel and the KC Commissioners forced taxpayers to spring for, for the THIRD dog park in little ole Port Orchard/South Kitsap. Jan Angel and the Howe Farm dog park gave me a reality check that people in control of taxpayer dollars clearly don’t seem to feel accountable for the way they spend our money. God only knows what the THREE dogs parks in the south end cost the taxpayer in ongoing yearly costs. Where was the outrage from the south end? Where is the outrage when the new mayor calls PO/SK ‘poor’ then turns around and asks for three times the salary in a job he had for less than a year? Checks and balances, yes. Accountability? Yes. Government accountability given? No. Dog parks are special interests….only for a select few, yet even people without dogs pay for them. Outrageous that PO/SK has THREE tax supported dog parks. City parks, county parks, are for the benefit of us all and attract others to visit….perhaps to move here. I believe parks are vital and necessary to the citizen and our economic growth. I wouldn’t want to live in an area that didn’t support parks. Sharon: I love you and admire you so much. Your common sense and logic are so refreshing.